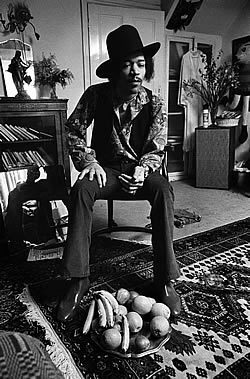 Handel House may seem an odd place to host an exhibition on Jimi Hendrix but the site incorporates the top floor flat that Jimi shared with girlfriend Kathy Etchingham back in 1968 as well as the 18th century residence of Handel, (where he wrote The Messiah). Set in the heart of Mayfair at 23-25 Brook Street, and the one place Jimi called his true home, rumour has it that he was intrigued by this musical connection and went out and bought the famous oratorio on record - though there's no mention of him attempting it on his Strat! Hendrix in Britain commemorates the 40th anniversary of Jimi’s death and charts his arrival to these shores in 1966, where he snuck through customs without a work permit, to play some of the most memorable gigs in rock history. Climb a thin, steep staircase (an accident blackspot for some of Jimi's inebriated guests) up to this 'compact' exhibition and find memorabilia rarely seen nor previously displayed in the UK. Portable CD players are strategically placed - listen to Voodoo Child or his Isle of Wight rendition of God Save the Queen whilst marvelling at his hectic schedule, the stellar line- ups and the mighty contribution he made to the sound of the electric guitar. His custom-made Gibson flying V takes pride of place alongside the psychedelic pink velvet jacket he wore. Nowadays, the flat is used as the museum's administrative offices, but to mark the anniversary, its staff are moving out for a 12-day stretch, taking the office furniture and equipment with them, allowing visitors to tour the space in which Hendrix lived, wrote, played and entertained during an important and prolific period in his life. There will be free entry to the flat on Saturday 18 and Sunday 19 September for Open House Weekend, for which advance booking is essential. Admission charges: Handel House Museum & Hendrix in Britain exhibition: £5 adults; £4.50 concessions; £2 children.